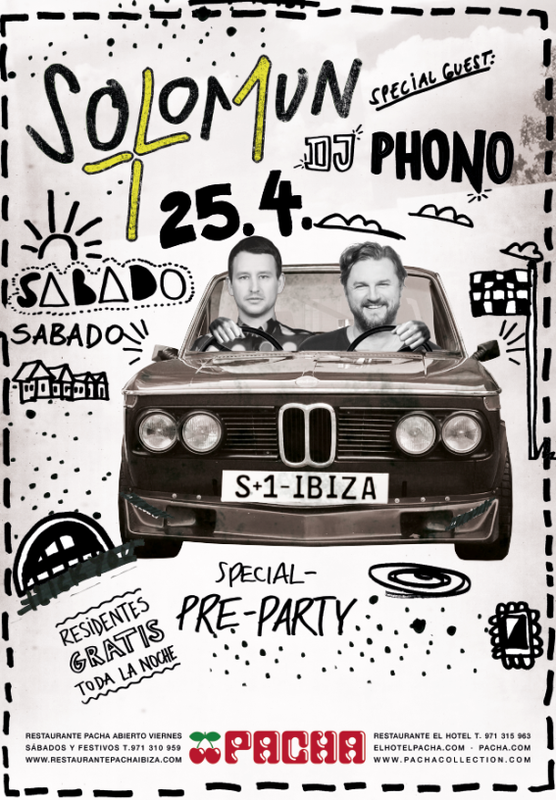 Pacha Ibiza presents: Solomun + Dj Phono pre opening party next 25th of April! Free entry for residents! The countdown for summer 2015 in Ibiza has started! 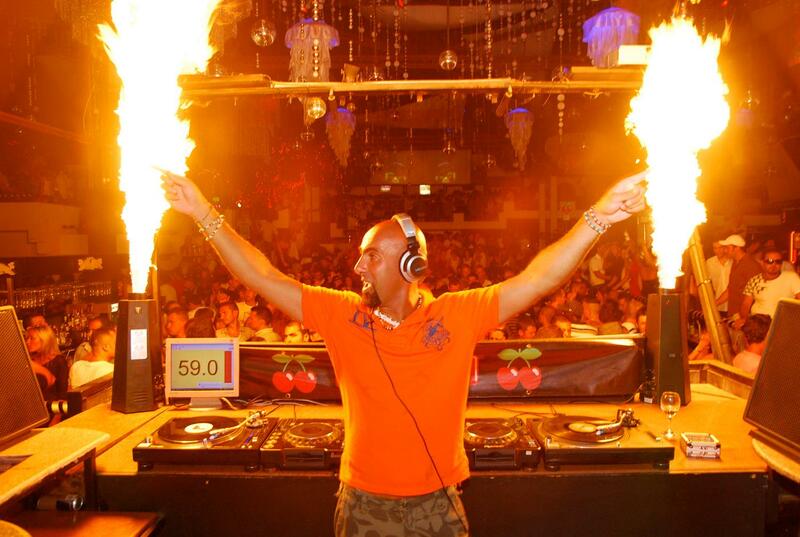 Saturday 25th of April will be celebrated an official opening pre party with Solomon! Solomun + 1, that for the third season will be celebrated every Sunday night at Pacha, presents a special event Saturday 25th of April, with special guest dj Phono, and the entry will be free! As said Pacha media team:”DJ and producer Solomun, together with Pacha, would like to thank the loyalty and support of their Ibiza public and will host a great pre-opening party to celebrate what will be the biggest night on Sundays during this summer in Ibiza: “Solomun + 1″, one of the favorite concepts of all good electronic music lovers. This summer 2015 promises to be stronger than ever. To celebrate it, on Saturday April 25th, the genius behind the Diynamic label will be by playing next to Dj Phono, an experienced Dj and producer based in Hamburg; to deliver an unforgettable set. The entrance will be free of charge for Ibiza residents who wish to start to enjoy the beginning of a great season at Pacha Ibiza…“. So on these premises…we have to wait just a few of weeks because of summer 2015 is going to start…and the team of Ibiza by night will follow the event! 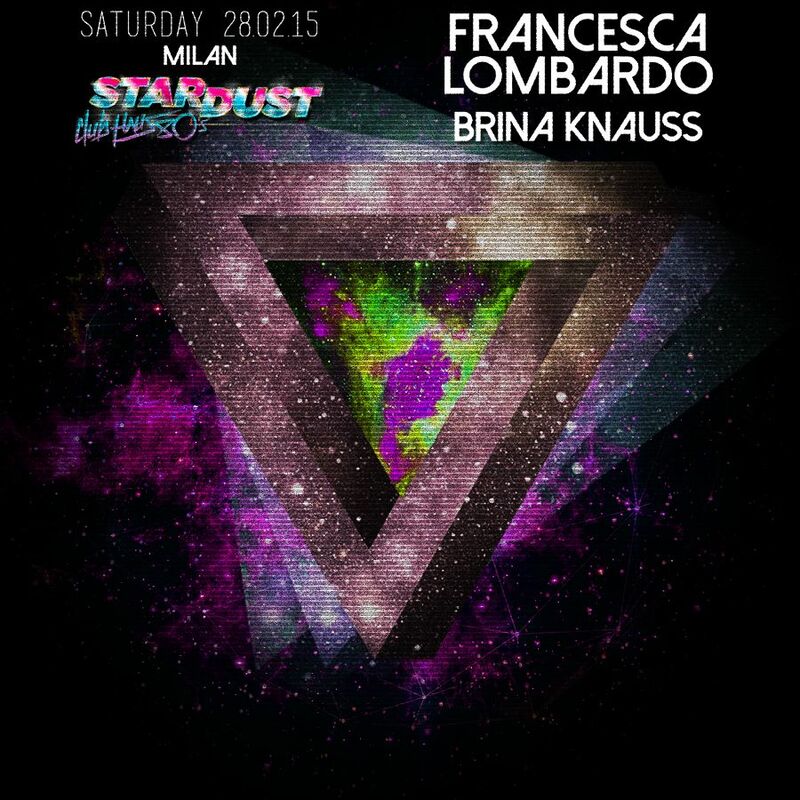 Tonight, Milano, Club haus 80’s and Stardust present: Francesca Lombardo and Brina Knauss! Ibiza by night follows its adventure during Milan fashion week 2015, and tonight there is another event in the city. Stardust and Club haus 80’s (Via Valtellina 21, Milano) presents an interesting duo: Francesca Lombardo a classy Italian artist that during summer time we heard several times in Ibiza in cult locations as Circo loco at Dc 10 and Brina Krauss. Be ready for a night with excellent music. Also today Ibiza by night also today follows to update about some job opportunities in Ibiza for summer 2015. And today we talk about a great casting for summer 2015… we talk about one of the most beautiful and elegant clubs of pacha group: Lio Ibiza! 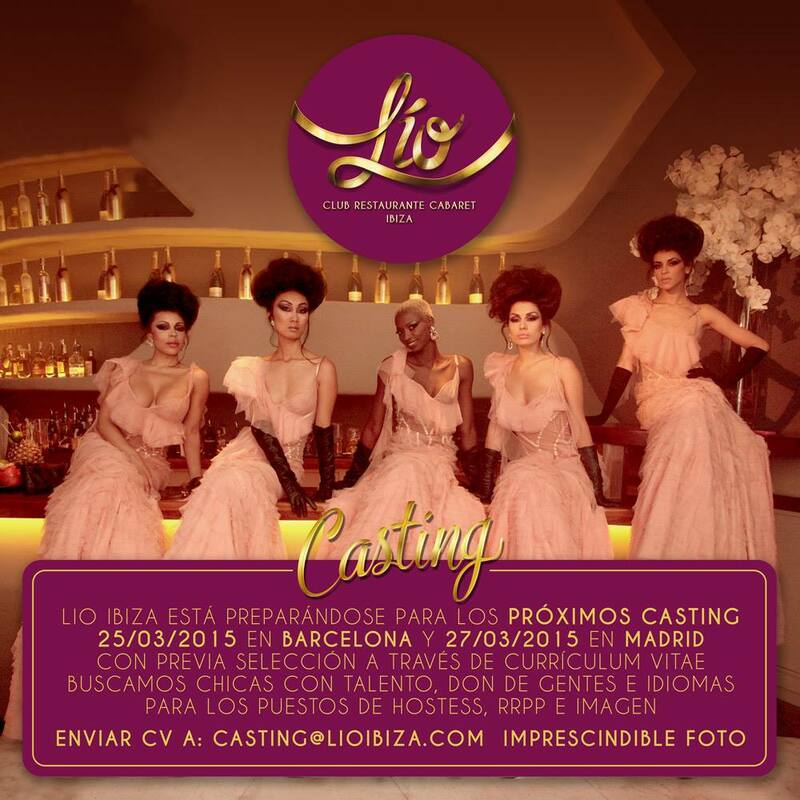 Lio Ibiza is searching staff for summer 2015: dancers, hostesses and rrpp. The selections will be made in Barcelona and Madrid. This is the official poster with the announcement and the dates: good luck! And don’t forget to read our disclaimer! Ibiza by night isn’t a job agency in ibiza and isn’t involved directly or indirectly in any casting. Ibiza by night doesn’t receive any economical advantage or profit from castings in Ibiza or castings worldwide. Ibiza by night doesn’t assume any responsability for the job offers in Ibiza and worldwide published on these pages. The jobs opportunities in Ibiza, in London, the job opportunities in Ibiza for summer 2015, in Dubai or worldwide are offered directly from the employers, and they give news about vacancies in ibiza. For further informations contact directly ONLY the organizers of castings at mentioned mail addresses or links and, please, don’t send us CV or more information requests because of we can’t help you. Ibiza by night no organiza ningùn casting y no ofrece ningùn trabajo en Ibiza o trabajo en Dubai. Ibiza by night no tiene nada a que ver ni directamente ni indirectamente en los castings y no gana nada sobre los casting y oportunidades de trabajo en IBIZA, y en el mundo que publicamos. Ibiza by night no tiene ninguna responsabilidad sobre las ofertas de empleo en Ibiza o en todo el mundo que se publican. Cortesemente contacten directamente a los que ofrecen el trabajo en Ibiza. No nos envien a nosotros CV y no pidan informaciones porque no podemos ayudarlo. Ibiza by night non organizza alcun casting ad Ibiza o casting a Dubai e non offre alcuna posizione di lavoro. Ibiza by night non ha alcun rapporto diretto indiretto con le offerte di lavoro ad IBIZA, offerte di lavoro a Ibiza estate 2015 (e nel resto del mondo) e non riceve alcuna utilità economica dai casting ad Ibiza (e nel resto del mondo). Ibiza by night non assume alcuna responsabilità circa le opportunità di lavoro ad Ibiza estate 2015, opportunità di lavoro a Dubai o all’estero pubblicate. Friday, Music on at New York with Carola and Stacey Pullen and Saturday lands in Miami with Carola and Dubfire! This weekend in the Usa there is a double appointment with Marco Carola and Music on, the show created and managed by Ernesto Senatore, Roberto Postiglione and Luca Piccolo. Friday 27th of February Marco Carola will play in New York at Marquee…and with Carola will play a master of Detroit Techno: Stacey Pullen! The day after Saturday 28th of February, Carola will move to Miami, at Story Miami, where will be celebrated the closing party of a brilliant winter season 2015… and for the final event with Carola will play also a great guest, Dubfire! So, prepare yourself for double great event…and then Music on will return in Europe for some important dates and then ready for the fourth amazing season in Ibiza 2015. Because of, in ibiza, Friday night, since three years is the night of Music on! Saturday Ibiza by night radio show presents: Leo Lippolis on Ibiza Live Radio! Ibiza by night radio show is back! Next Saturday, 28th of Fabruary, starting at 20,00 till 21,00 (Spanish time) Ibiza by night radio show presents 2015’s fourth exclusive session on http://www.ibizaliveradio.com, the web radio created and directed by our great Miss Luna! 2015 has started in the best way: after the brilliant results of Aldoina Filangieri, Give us the tools and “The Princess” Sarah Main, this week we follow with an excellent artist: Leo Lippolis ! Leo (in the pictures below) is an Italian dj and producer based since many years in Sicily and in Usa, where he played in several prestigious locations, and last summer played also in Ibiza for a couple of exclusive events! And, has said his media team:”Throughout this time LL has carved out his very own style, a cocktail of Italo House that drools sophistication and sensuality whilst at the same time kicks in with a heavy bottom end resulting in a sound that both moves and soothes..“. So be ready for a new one great episode of Ibiza by night radio show, because of the sound of Leo is classy and intriguing…and we are absolutely happy of his session! And..stay tuned, because of the family of Ibiza by night radio show is getting still bigger: after Sarah Main, NiCe7, Give us the tools, Rafa De Siria, Joan Ribas, Stephan Esse, Sasa Mendone, Kika, Stefano Cioffi, Eran Lump, Lorenzo Calvio, Agent, Aldoina Filangieri, Reelow, Gaty Lopez, Paul Kenny…are arriving new great friends..next episode will be played from Lady Eli Rojas (Blue Marlin Ibiza), then Alex Kennon, Franco Moiraghi and many more! So…as we already said: 2015 of Ibiza by night radio show follows with great music! Welcome Leo … we are ready to hear you again in Ibiza in summer 2015, and many thanks to”Lady” Elisa Russo for the media support. 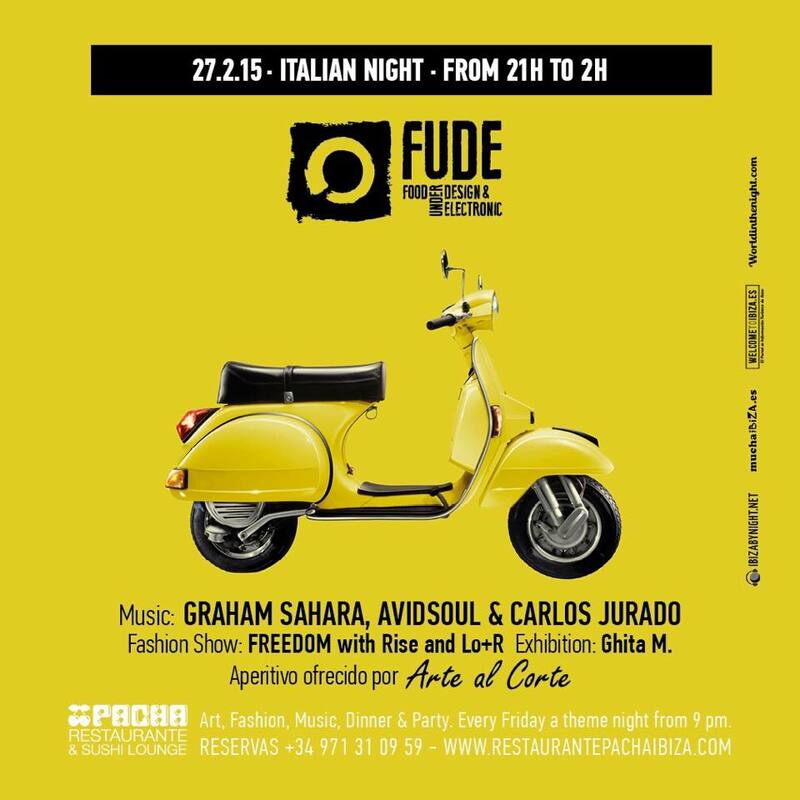 Friday, Pacha Ibiza presents: Fude…Italian night, with Carlos Jurado, Graham Sahara and Avidsoul! Friday, Pacha Ibiza presents: Fude the cult dinner show of Friday night. This time the theme is the…Italian night! And for a special night will be proposed two Italian meals, Lasagna bolognese or Vegetables with Risotto with chef Victor Martinez and an aperitif offered by Arte al Corte! But Fude it’s not only food, but also refined music, and this week in consolle will play “The Doctor” Carlos Jurado, plus Graham Sahara and Avidsoul! During the night there will be also – as all the weeks- a fashion show this time with Freedom with Rise and Lo + R and an exhibition by Ghita M.
But the night won’t finish with Fude.. don’t forget, after, still at Pacha, there is an unmissable Ibiza talents (organized by Davide Avallone)! Here you have the poster of the party, that has the media partnership of Ibiza by night! 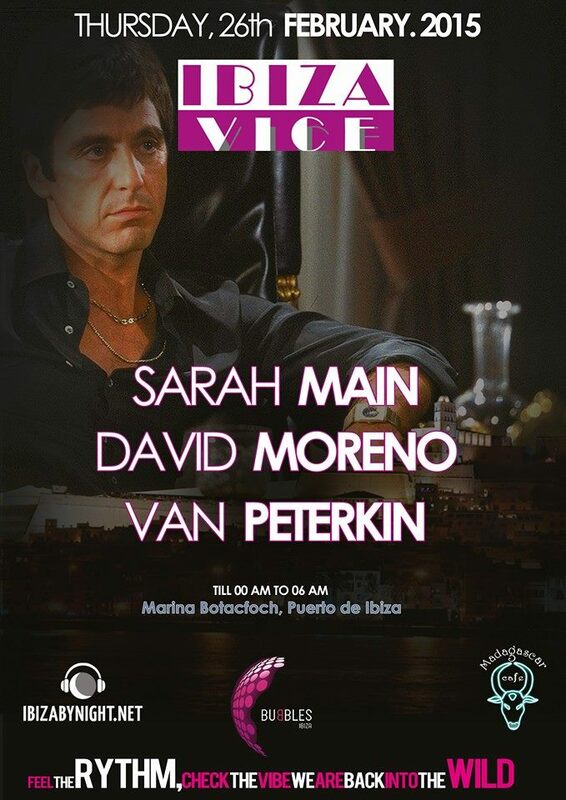 Thursday, Fernando Pablo Link presents: Ibiza Vice at Bubbles! With Sarah Main, David Moreno and Van Peterkin! Thursday 26th of February, at Bubbles (Marina Botafoch, Ibiza), from midnight till 6,00 am, will be celebrated a new episode of the cult party “Ibiza Vice”! The event, created and managed by the promoter Fernando Pablo Link, also this week presents a great line up composed by “The Princess” Sarah Main, an Australian dj and producer based since years in ibiza, that during summertime is the resident at Ushuaia, plus Van Peterkin and David Moreno of Ibiza Global radio: as you can see will play three dj’s absolutely known and respected in ibiza, that will guarantee excellent music. If you are in Ibiza, don’t miss this event (that has the emdia partnership of Ibiza by night) because of Thursday night is under the sign of Ibiza Vice!